When you need to drill a hole in stone or tile, usually for faucets or plumbing fixtures, the easiest way is with either a diamond hole saw or core bit. Hole saws are usually used with either a 3/8” or ½” drill. They have a pilot bit in the center for stability. If you’re using a press or a angle grinder, you will generally use a coring bit. 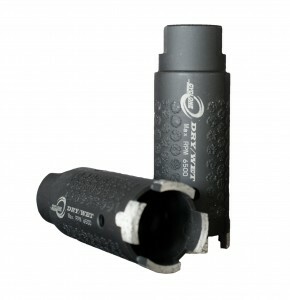 We sell adapters that allow you to use a 5/8” – 11 bit on a drill. 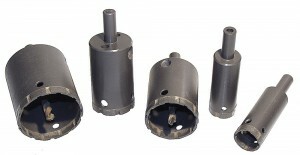 When using these bits on a grinder, it must be low-speed capable as 2800 RPM is about the maximum speed for core bits and holes saws to operate efficiently. The larger the bit, the slower the speed. Both coring bits and hole saws are available in continuous, segmented, turbo and electroplate rim styles and the style to chose depends on the material you are working with. Here is a tip for using hole saws: remove the center bit. Using a wood cutting hole saw, cut a hole in a piece of 5/8” or ¾” plywood. Place the plywood hole directly over the hole to be cut in the stone or tile, and place your hole saw in the plywood and begin cutting. By using a plywood template, your hole saw cuts will each take about 50% of the time they would if you kept the pilot bit in the hole saw. Granite cuts best with a segmented rim. Thin rims cut quickly but have shorter lifespans. I prefer to use a wet/dry bit, as there are times you are working in a finished home and it can be difficult to contain all the water in those situations. Some bits offer side protection which helps clean out the hole as it cuts, which gives you about a 20% speed advantage over a similar bit without side protections. I prefer a turbo rim bit for cutting ceramic tile and softer stone. These are a bit slower cutting than the segmented rim blades, but they reduce chipping, which is important. The turbo rims are the best compromise between speed and clean cuts. Because it is very hard, porcelain tile works well with the same bits as granite, but segmented blades tend to chip porcelain tile. For that reason I suggest using a turbo rim bit. For extremely fast cutting, you may want to use an electroplate bit. They are fast, but don’t last long. All that being said, let say you are a home owner or contractor who rarely needs one of these bits, or you deal with a variety of materials, both hard and soft. If you need one bit to do it all, I would go with the RockMaster Smooth Cut Turbo bit. It will perform well on all stone and tile, and they are durable, long-life bits, and the price is very fair. Pro’s who do this day in and out will use a variety of bits, each best suited to the job at hand. I hope this helped, and happy coring! This entry was posted in Uncategorized on August 4, 2014 by Badsero.